I'm running out of explatives to trll you how much I love your work. Suffice to say I like them. I lied when I said I hate you for it, but there are definitely smudgeons of feelings of envy here. To respond to you suggestion of me doing some III... 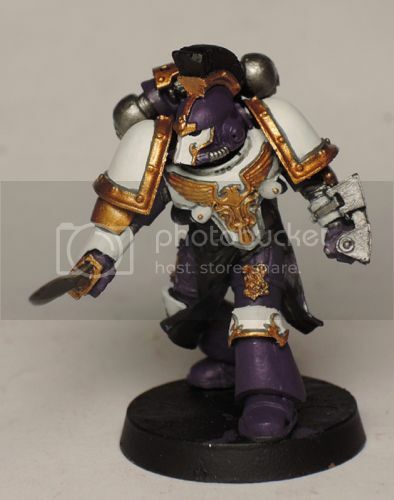 I do have some palatine blades lying around, which I plan on using as noise marines... Some day. The red really seems to complete the model, nice work! I can never do the III Legion now... Mine will never be worthy. Those are my favorite yet. As others have said Kiz, we are running out of superlatives to describe your incredible work. Kudos sir. You've no idea how close I came to painting the toilet gold and calling it the "golden throne" but thought that might be going too far! If I was put in a dreadnought, I would like to have full maneuverability not just waddle waddle shoot waddle punch. I'll write up the step by step when I get a chance. Thanks bro, pretty sure I'd go insane if I tried to paint two full units of 20 though. One unit of 10 is hard enough... the white really slows down the process. Yeah, I'm pretty happy with how it turned out. At this stage I'm going to keep the red pretty limited on the 'regular' marines, but it works nicely on the sergeant. Nonsense!! 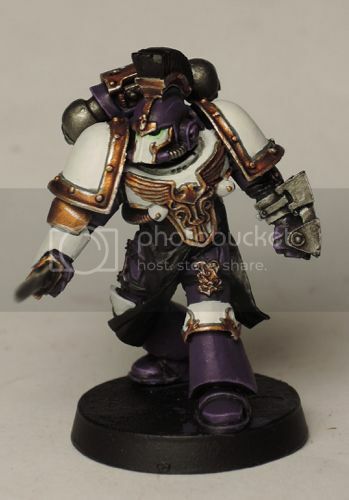 Your Emperor's Children will be awesome! Thanks a lot mate! I appreciate it. But seriously, have you thought about also giving these guys Red Cloth too? Or painting the leg straps a Leather-Brown? BTW, I love everything you've posted on here, such magnificent inspiration all around! I think I'm almost out of words to describe your mini's but damn Kizz, they are stellar! Man, those look great, Brother. The gladius and shield combo alongside with the white, the crest and ornamented armour make for a beautiful combination. 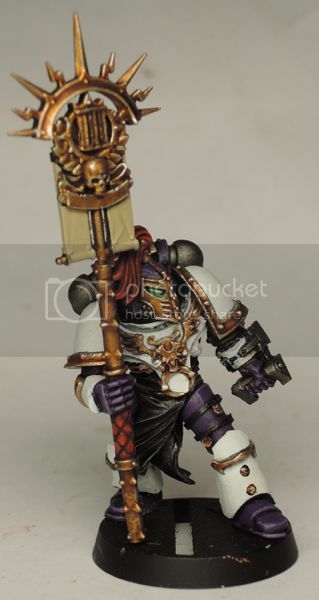 I have to agree with some of the others that painting the tabards red like the sergeant would look much better. Also, how do you manage to apply round transfers so well? I always have trouble with round ones, like the IF or UM transfers. Edited by GrandMagnus, 26 May 2016 - 04:05 PM. 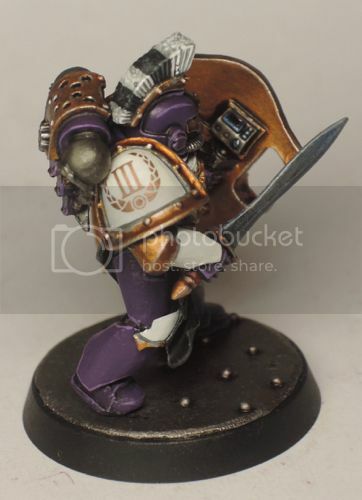 I love the burnished gold on the backpack, the effect is excellent. 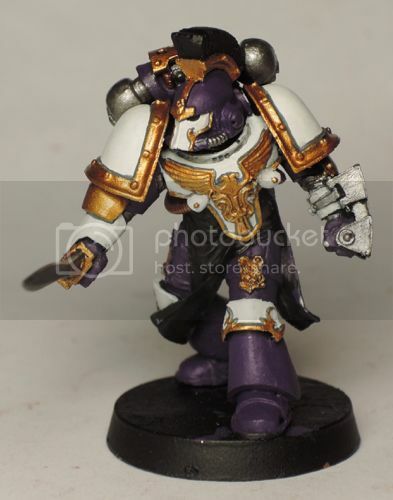 I must admit looking back at your old models I can decide which I love more, the silver palatine blade or these Breachers with the white. I got shivers off that second pic. Just exudes a perfect amount of cool+menace. Edit - a few words. Edited by SalvationOfReason, 30 May 2016 - 06:10 PM. Other than that, what Slipstreams said. 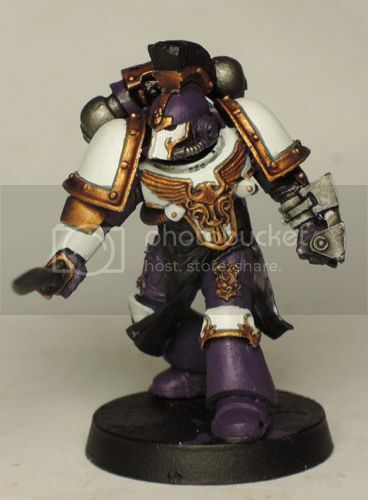 Dammit will you stop making me want to collect Emperors Children!!!!!!!!!!!!! 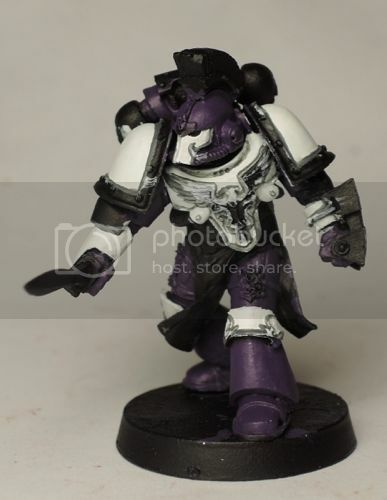 I'm surprised at how well the white works with the purple. In fact, I think it looks far better than the silver; bloody gorgeous. Any chance you'll be throwing a Saturnine-clad character into the mix? Time for the Palatine Breacher step by step. As usual with my Emperor's Children I started off with an undercoat of Chaos Black spray. I then painted the purple areas of the armour with Xereus Purple. Next up I started on the 'white'. 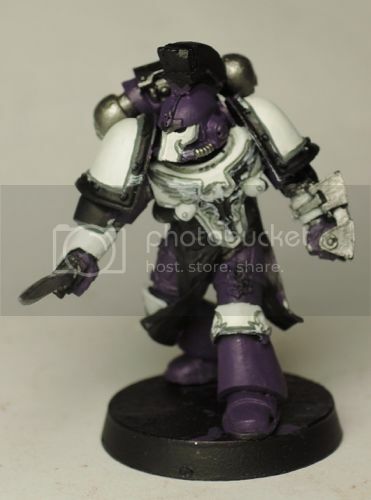 Usually I'd leave white until last because it is so easy to pollute it with other colours if it's painted early on in the process, but because 'white' is such a dominant colour in this scheme and because there is so much detail on top of the 'white', I had to make an early start on it. 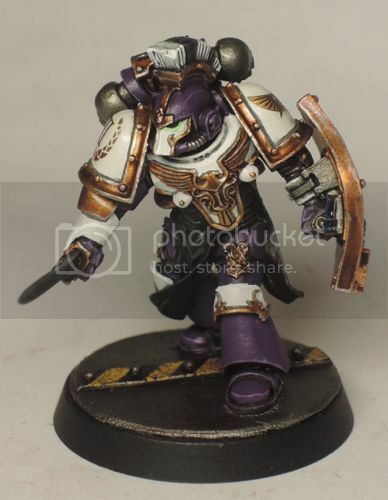 The 'white was a 1/2 mix of Celestra Grey and White Scar. I applied two thinned coats to achieve a smooth and solid finish. The next step was to 'black line' the 'white' with watered down Mechanicum Standard Grey. I then painted the 'silver' areas (power pack vents, gladius blade etc) with Leadbelcher. 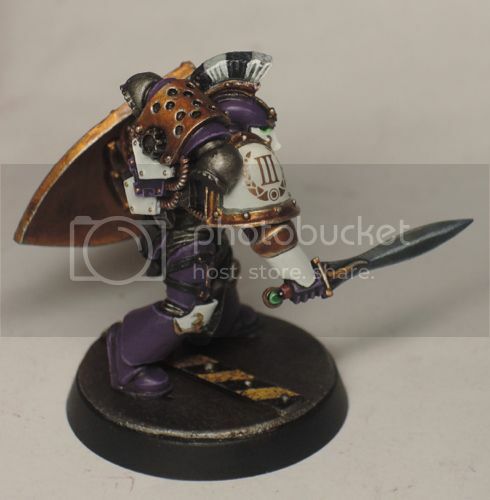 The gold was base coated with a 1/1 mix of Gehenna's Gold and Retributor Armour. 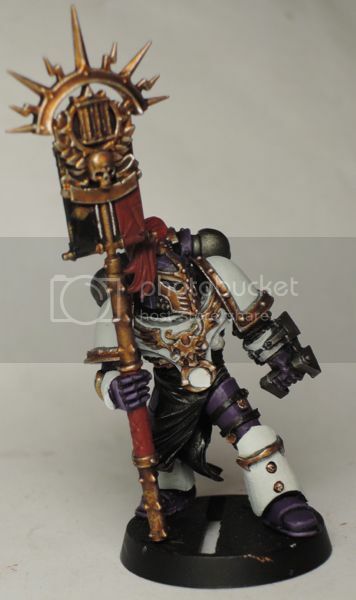 Retributor has a much higher pigment concentration and helps to give the Gehenna's better coverage. Next I used Balthazar Gold to paint some of the pipes/tubes such as on the power pack and under the arms on the sides of the torso. The gold was washed with Agrax Earthshade and the Leadbelcher was washed with Nuln Oil. 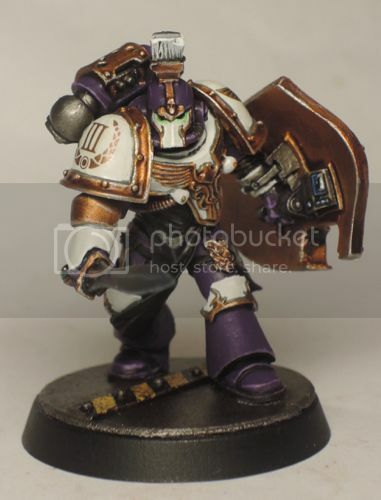 The gold was finished off with a highlight of Runefang Steel. 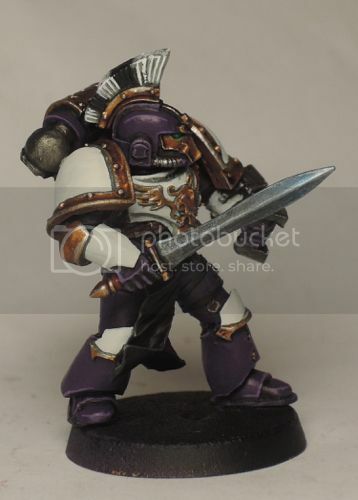 I then finished the purple by 'black lining' it with some watered down Abaddon Black and a highlight with Geenestealer Purple. Haha, thanks bro! I thought about giving them all red cloths but I thought it might be a bit much. I'll wait until the unit is finished and then make a choice about whether I want to leave them black or paint them up to be the same as the sergeant. Thanks for the kind words and encouragement, bro! Thanks a lot! Glad you like the shield/gladius/crest combination. I'm trying to give the unit an Imperial vibe and the Roman Praetorian Guard were a definite source inspiration. With the round transfers such as the laurels I was able to cut out the centre of the decal so that it was more flexible and easier to position. The Palatine Aquillas and the III numerals were more difficult because I couldn't cut out the centres, but I used a decal softener and that seemed to help a bit. I also used a hobby knife to make some small cuts in the decals if they weren't lying straight. A nice coat of spray on matt varnish also helps to smooth out the decals and give a much cleaner finish. Thanks a lot bro! I'm glad you think the new legionaries measure up to the Palatine Blades. I got shivers off that second pic. Just theorist amount of cool+menace. Thanks bro! It's good to hear that you feel that the mini is menacing. 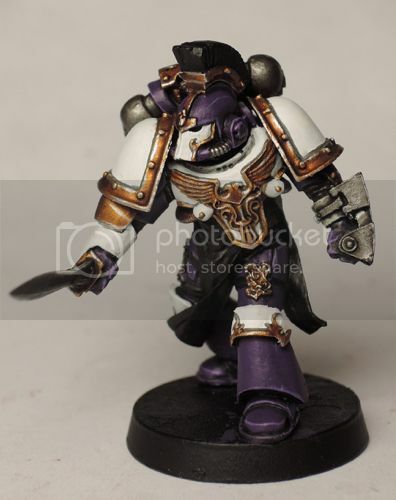 Sometimes it's harder to make the Emperor's Children look sufficiently dangerous. Hahaha, thanks a lot bro! Thanks bro! When you say 'Saturnine-clad character' are you referring to the Saturnine Rams or something else? Next up I started on the red. This is the same method that I used for the sergeants cloth. 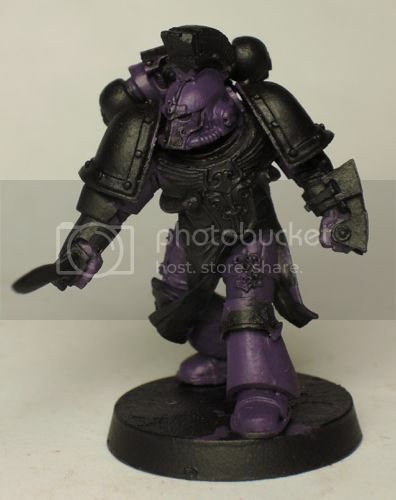 The first colour was a base coat of Khorne Red mixed with a little bit of Xereus Purple. I then washed the red with Druchii Violet. And highlighted it with Blood Red. 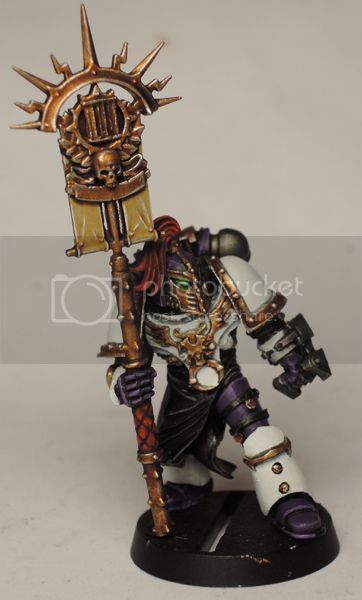 The eyes were painted in the usual way using Snot Green and White Scar. The black loincloth was highlighted with a 1/1 mix of Abaddon Black and Mechanicus Standard Grey. I also base coated the parchment on the vexilla with a 2/1 mix of Screaming Skull and Steel Legion Drab. 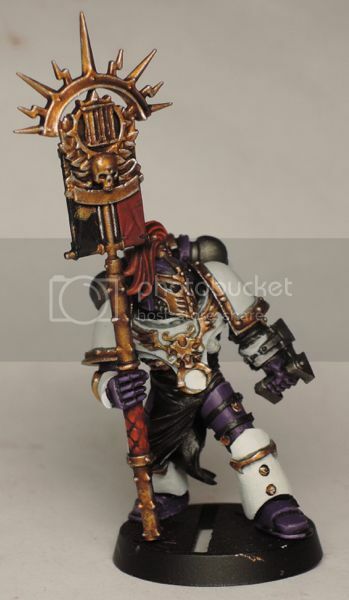 The loincloth was finished off with a highlight of Mechanicus Standard Grey. 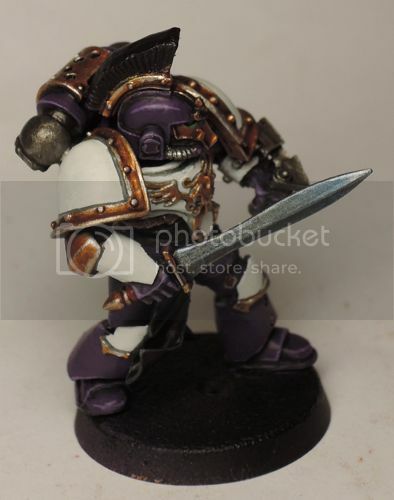 The gladius blades were given a thin glaze with Guilliman Blue. The parchment was washed with Seraphim Sepia. 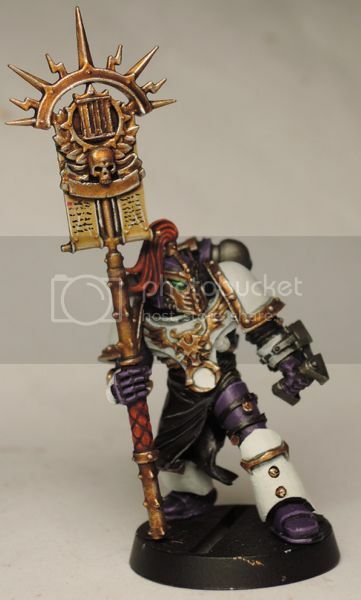 The parchment was finished with a highlight using a mix of Screaming Skull and White Scar. The script was painted with Abaddon Black. 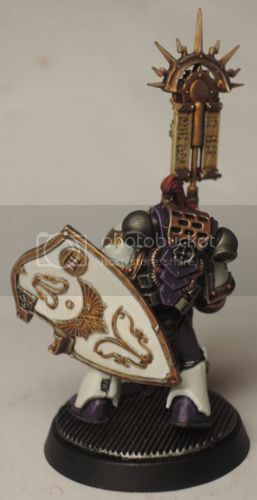 I then moved on to the crests. 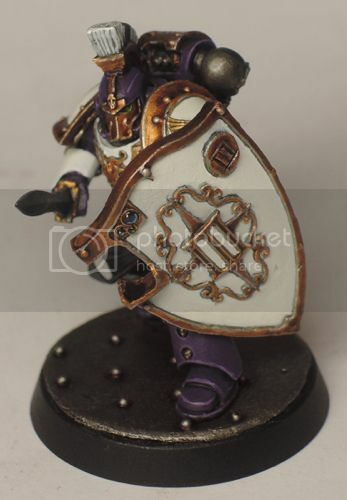 The white was base coated with Celestra Grey. 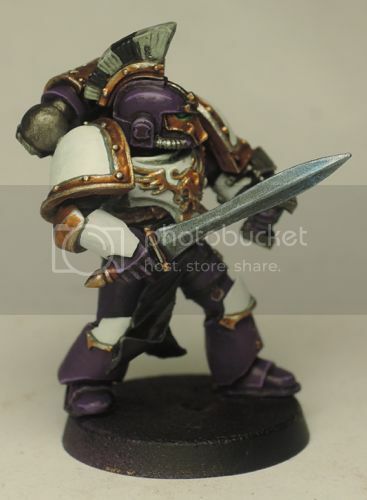 I then washed it with Nuln Oil. 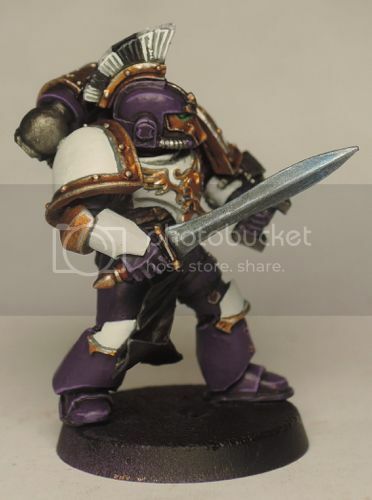 And highlighted it with White Scar. 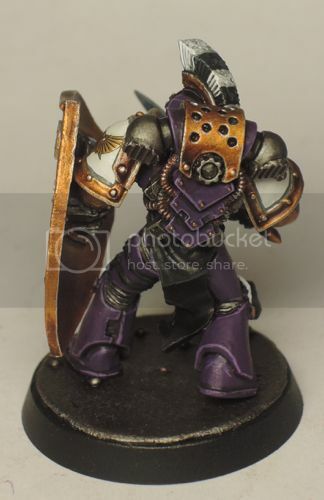 The black horsehair was highlighted with Mechanicus Standard Grey. The minis were finished off by adding the decals and shields, and attaching them to their bases. 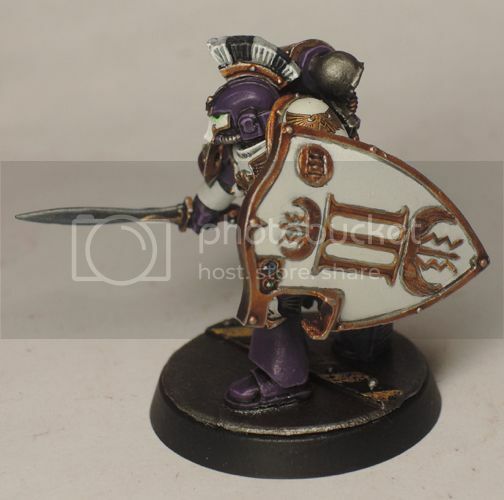 The front of the shield were under coated with GW white spray, but apart from that were painted in the same way as the rest of the minis. 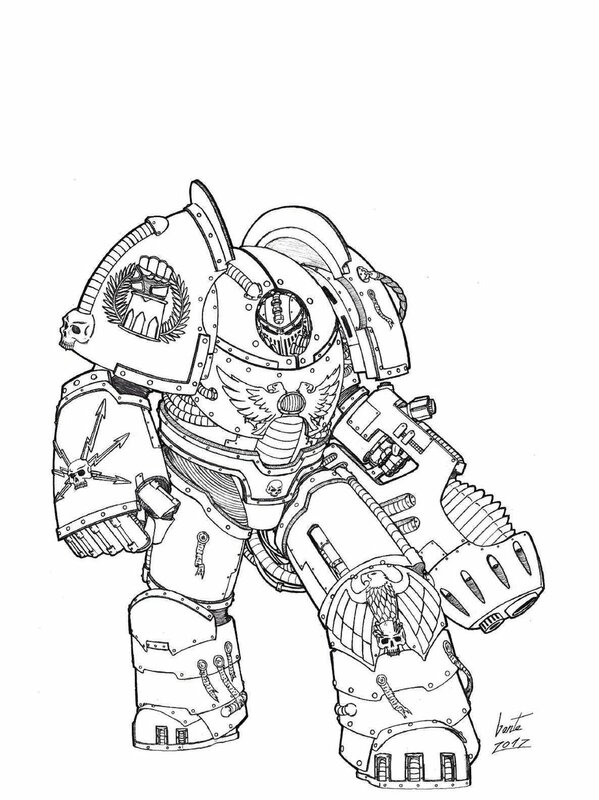 Aha, probably should have clarified that better; when I refer to Saturnine, I'm referring to the fact a handful of people believe it's the old Mark I Tactical Dreadnought Armour. Greyall and KrautScientist have come up with some pretty awesome interpretations of the old suit. 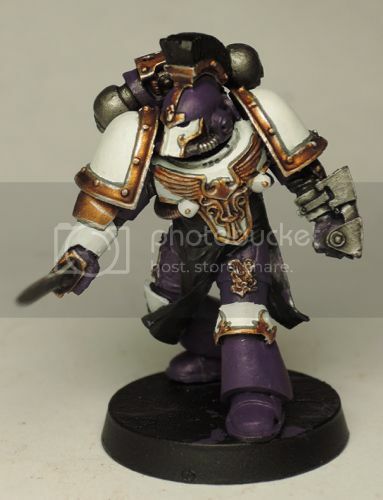 That aside, still love the breachers; might have to give that painting guide a shot after ETL is finished. 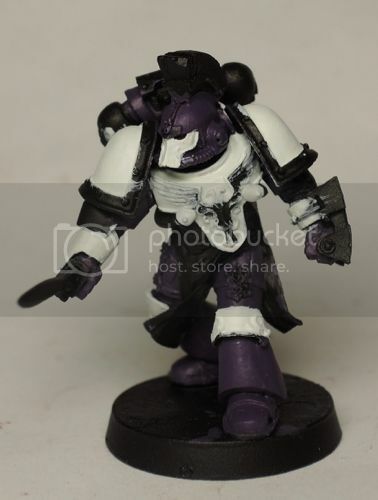 I find it so amazing how simple the purple is, but the results are just fantastic, you really go to show that quality paint jobs don't need to be complicated. I do wish I could bottle your talent though. 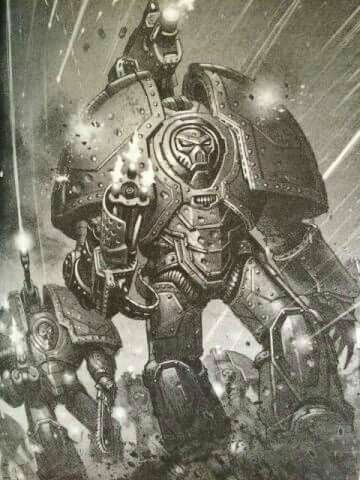 Give them oval shields instead of medieval ones and these breachers would look like they popped out of ancient Greece or Rome. Marvelous job, though I concur that I'd rather their loincloth be red. For what it's worth, I'd stick to black loincloths for the rest of the squad. 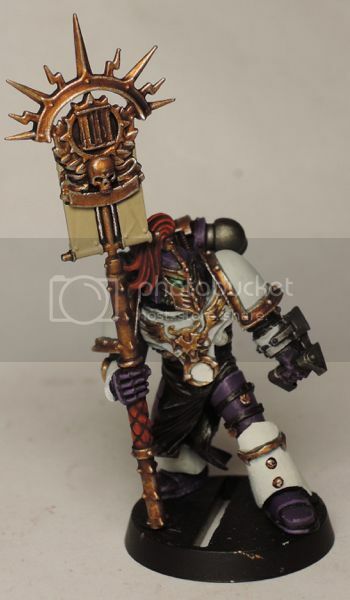 Much like the unique helm on the standard bearer, it helps the sgt to subltly stand out from the rest of his bros.
Keep up the awesome work, man! I'm loving the predominance of white on these guys. It really makes them look polished and elite. I'm of two minds about the loincloths, since it came up. 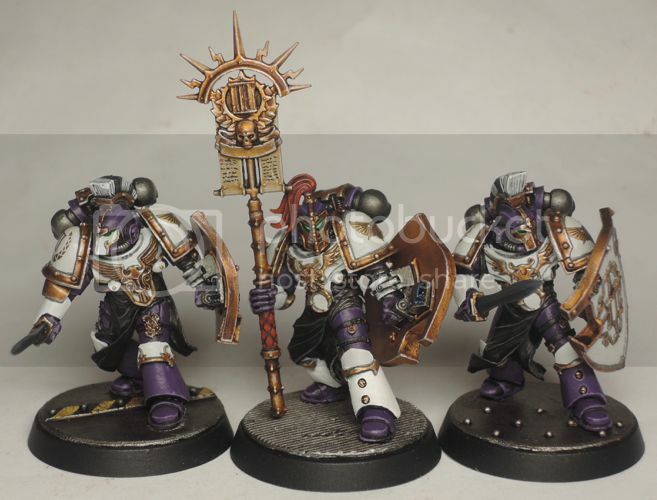 On the one hand, I don't think black suitably complements the awesome work that you're doing on these models. 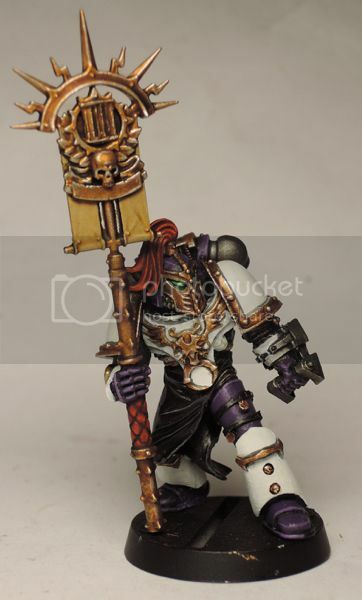 To me, at least, it looks a little bit unfinished and detracts from the models slightly. On the other, I do agree with Noctus and Flint in that red should be held exclusively for the Sergeant -- he should have something to make him stand out a little bit more. Perhaps a different color? Maybe a light tan or more off-white? 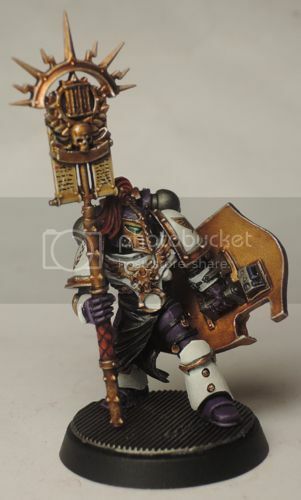 Sorry if it has been asked but where did you get those shields? Awesome looking dudes and great tutorial!